Welcome to our oasis of peace in the heart of Benidorm! Would you like to know what a stay at the Hotel Don Pancho is like? 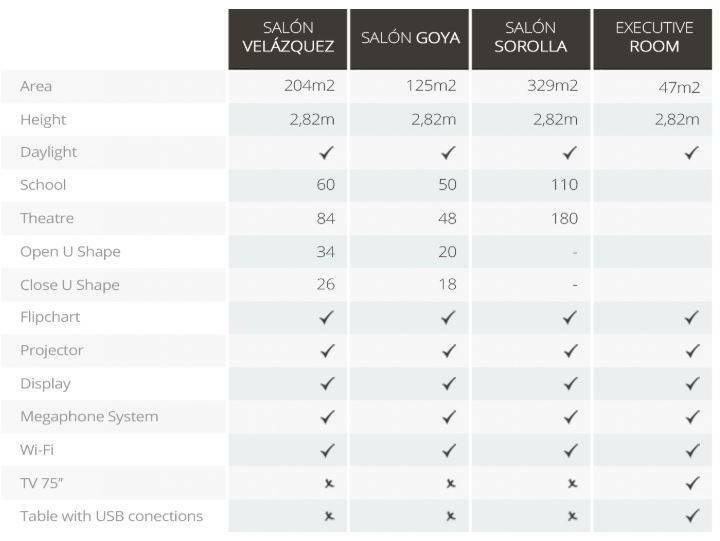 Choosing luxury hotels in Spain not only allows you to unwind but also to enjoy a number of advantages you won’t find in other hotels. The benefits of luxury hotels like Don Pancho make it different from the rest of any regular hotels. We are talking about the different stages you can live from the moment you walk through the hotel door. That’s to say, details to value the quality treatment of our hotel as well as its facilities and exclusive services. We will tell you about it in this post. Ready to imagine yourself enjoying all of these pleasures? A heated outdoor pool and a chillout terrace: relax assured! Why don’t you get new energies in the massage room? The main goal of our luxury hotel is to provide you with any essential in order to disconnect and relax. And, you may wonder how we are going to achieve it. That’s simple! We will get it making you feel like you are the most special and important person for us. The personalized treatment you receive from the very first moment you do the check-in is, without a doubt, the first thing will surprise you when arriving at our luxury hotel in Spain. 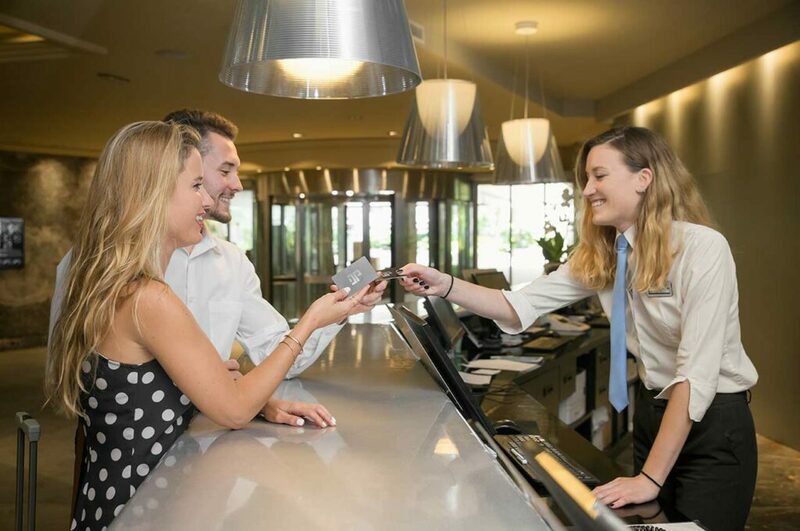 We will be at your disposal throughout your stay so that you can share with us any suggestion or problem or make a simply question that might arise. We are always willing to help you as best as possible. The wide range of rooms we have will allow you to choose the one that best suits you. Our aim is that you feel as comfortable as possible and don’t lack of anything. In our luxury hotel hotel in Spain you will find over 200 rooms. All of them with a special, elegant and modern design. But that’s not all! 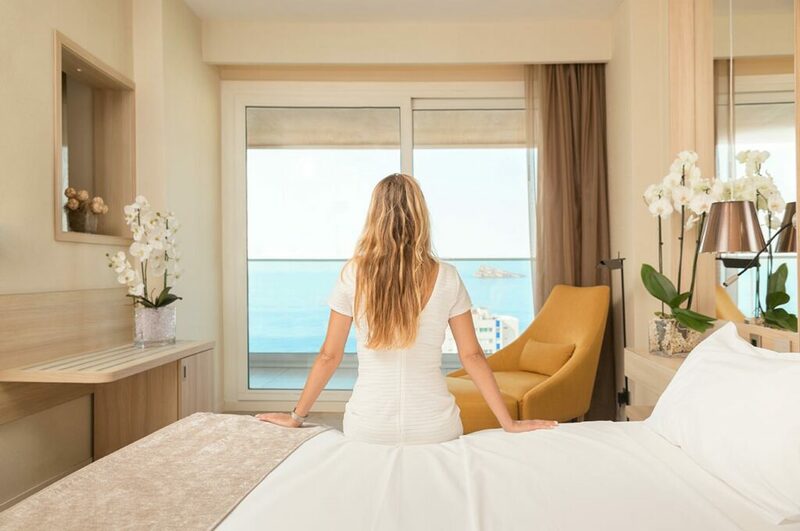 Imagine waking up in an exclusive room and the first thing you see is the crystal clear Benidorm sea from your terrace. It would be like a dream, wouldn’t it? Moreover, our rooms have free Wifi, a satellite TV with over 30 British channels and a mini-fridge. We would like to meet your expectations! 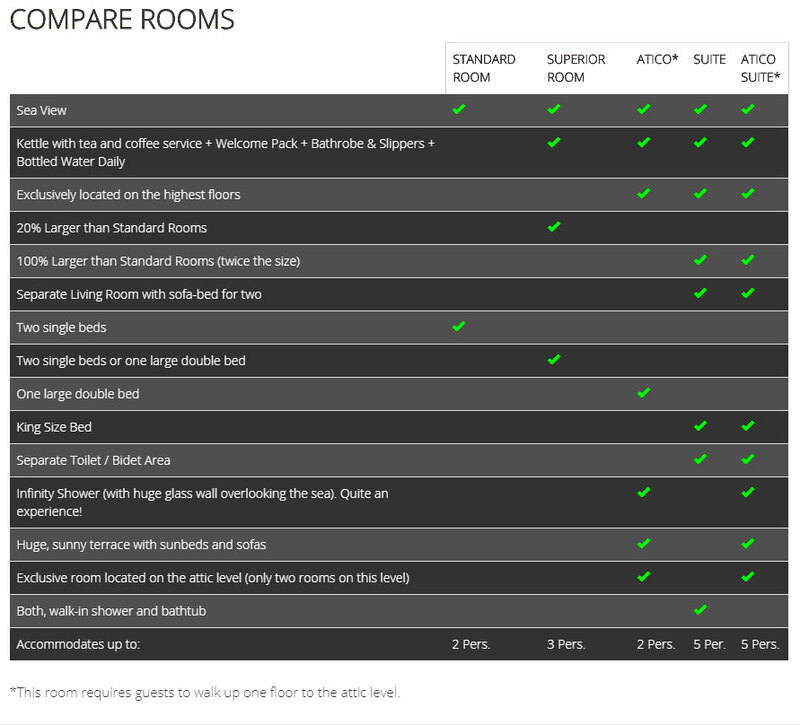 That’s way all of our rooms are grouped into five types to suit your needs. You will able to choose between Standard, Superior, Suite or Penthouse rooms. The Hotel Don Pancho is an authentic oasis where you can relax sunbathing or having a swim in the pool. In fact, you always have at your disposal our heated outdoor swimming pool. Yet, if you prefer refresh yourself by drinking our delicious cocktails, then your place is the chillout terrace. 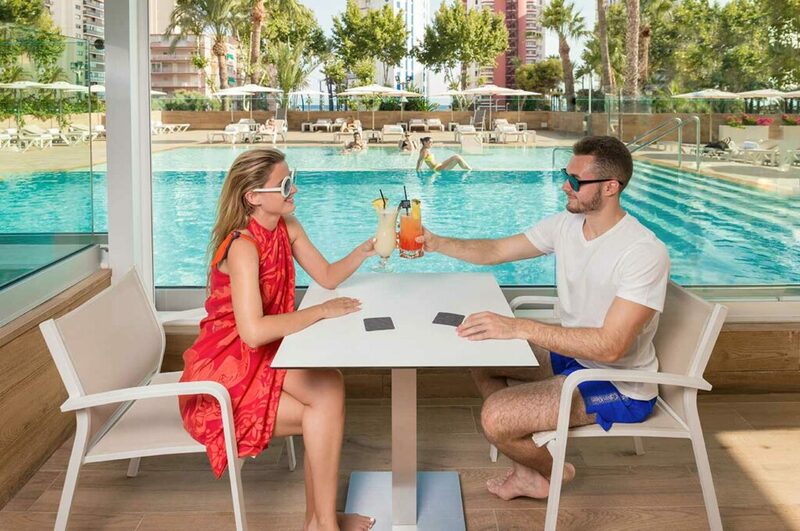 Sit by the pool and enjoy Benidorm’s warm weather while having a tasteful drink. Without a doubt, it will be a pleasant experience. Forget about your work, relax and switch off while enjoying a well-deserved vacation and a relaxing massage. Our team of professionals will take care of you and make you feel wonderful. All you have to do is let yourself go. Once you taste the gastronomic selection of Don Pancho Hotel, you will discover why Benidorm is known as a culinary paradise. 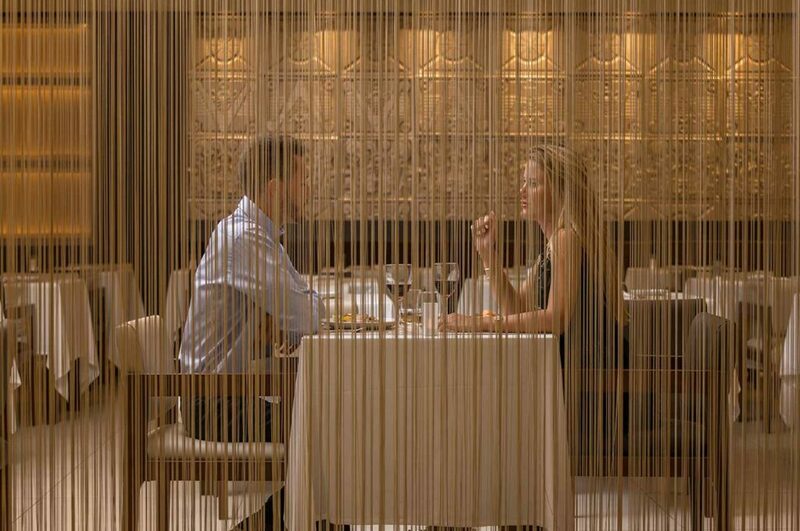 In the restaurant, a variety of exquisite and diverse breakfasts, lunches and dinners are served. Dishes with meat, fish or rice are carefully cooked by our excellent cooking team. You will even able to see them working live in the Show Cooking area. While on vacation, you can’t miss memorable moments of entertainment. And for that, the Dancing Lounge of Hotel Don Pancho is the right place! Live music shows, all kinds of dances and shows rotate throughout the week. We love to surprise you with new shows. So we are sure it will be one of the most awaited moments of your stay. In addition, in the Lounge Bar there is a wide range of cocktails, drinks and refreshments to choose from. Why not try them while enjoying live music, a magic or flamenco show? Imagine a vacation enjoying all our services! It will be for sure a perfect way to find the peace and calm you are looking for. From the Hotel Don Pancho we will do everything possible in order to make your stay a memorable one. We hope you see you here soon! I love coming to Don Pancho my husband Keith is 70 next year and we are booking from the 01 04 2020 he would not go anywhere else . I have had a couple of birthdays with you in January and Christmas so I am out going to argue. We will see you then looking forwards . Thank you very much for choosing our Hotel to celebrate your husband’s birthday. It would be an honor to welcome you back to offer you our hospitality once more. Kindest Regards. We return to The Don Pancho year after year, all that is said in this example is perfectly true !…It certainly feels like home from home every time, and the staff are so helpful and friendly..
We are returning in April 2019 for 3 weeks, and cannot wait……Bliss !! It is an honor for all of us to read your beautiful comment about the Hotel. Thank you! We look forward to welcoming you again this April here in your home in Benidorm. Kindest Regards. We are very glad to read that you have enjoyed your stay at Don Pancho. We cannot wait to welcome you back next January for a another fabulous holiday! Thanks a lot for your lovely comment. We also hope to have you with us soon again! Warm greetings from all the team.